We are coming up on Mac Attack weekend, so I’ll give you what help I can to increase your chances of placing. For the last three years, late August fishing has been poor, so this year, we began fishing radically deep (300-320 feet). The fishing still hasn’t been spectacular, but it’s better than before. The fish at the sea depths seem to run bigger (3-5 pounds) and have meat that is a bright salmon orange color due to the abundance of shrimp they are eating. This makes them great table fare. We’ve been finding fish all the way along from Skidoo Bay on up into Blue Bay, but there is no reason you shouldn’t find them anywhere in the trench that runs most of the length of the lake. Paul Soukup had a good few hours Aug. 18 using Glo Grubs with a fly above them. We, on the other hand, have had the best luck on a 1-ounce Rattle D Zastor and a whole fish setup. Green cut fish with a little shrimp scent or WD-40 added makes adequate bait. For shallow water fishing, the depths that I hear the most are 80 to 90 feet. The whole fish setup has been taking the most macks, with trollers also catching a few. I’ve heard some unverified reports of whitefish being caught at the north end of Flathead near the river mouth and the point at Woods Bay. I’ll keep you informed if I hear more. One of the administrators of the Christian camp at the southwest corner of Lake Mary Ronan came in the store recently and said he was limiting out every day on kokanee at the eagle nest hole on the west side of the lake. He is using an Attracta-fish glow hook combination in a 31-foot depth. He said the fish were up off the bottom at 21 feet and also that he was catching them between 10 a.m. and 1 p.m. Miles Marchi and I caught a nice mess of perch late Saturday afternoon, Aug. 17. We didn’t start fishing until 6:30 p.m. We caught most of them in front of Doug Wold’s place, which is the north point of Glenn’s Cove at a 14 to 15-foot depth. 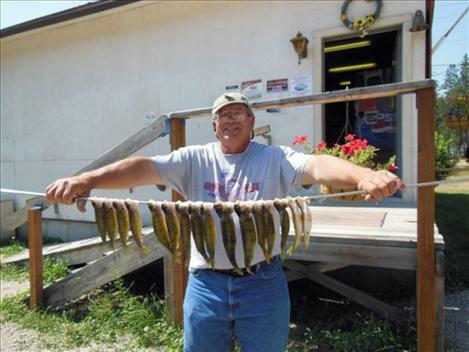 Using a night crawler will catch you an abundance of baitfish as well as perch. A few of these perch also came from near the submerged light at the newest public dock in Polson. The smallmouth bass in the Flathead River below Kerr Dam have begun to be much more aggressive as waters cool and they are preparing for the winter season. A variety of dark-colored plastic baits work well for these scrappers, as well as nightcrawlers. For more information, call us at (406) 675-0068 or email us at macman@ronan.net. Our website is going to be overhauled soon, and you will be able to order more from it, as well as get timely reports for fishing the Flathead. More products will be added soon. It’s hard to imagine we’ve been in business, both from our home and in our store, for 28 years. We have some of the finest people in the world who frequent our store. Thank you for your business, and good fishing.